This week, we had another session of poetry. Although this week is very different from every other week as we instead had Mr Johnston and Ms Mclain rather than our normal teachers. Although this post isn't about the teachers, as it is instead about the poetry. 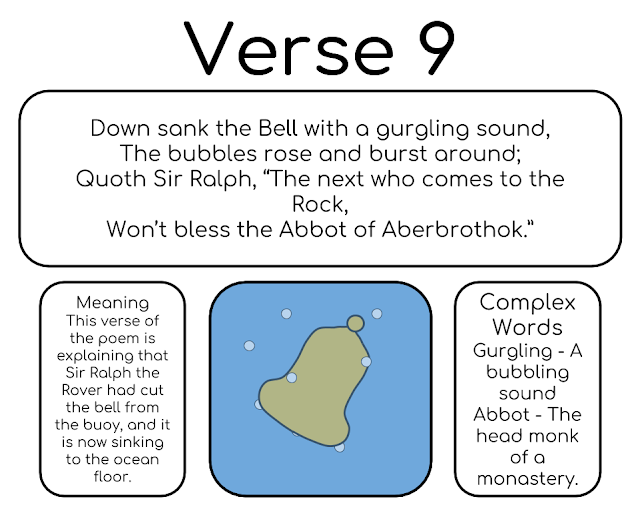 This week, we have read a poem named The Inchcape Rock. It is a very old, yet very good poem created in the 1800's, and our task for this week was to choose a specific verse, and explain what it means, and add a picture. (Although with only the two my DLO didn't look that good so I also added a slot for more complicated words that some people may not understand). The verse that I had chosen was the 9th verse of the poem, and in this verse, it explains about the inchcape bell sinking down to the bottom of the ocean.